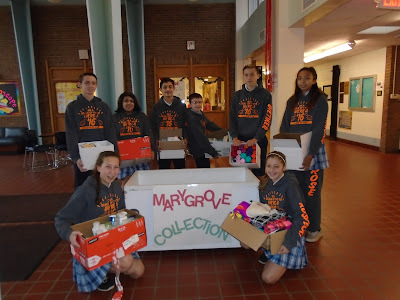 For the first two weeks of Advent, St. Rose students hosted a collection in support of the Marygrove residential center. Each grade level was assigned a particular personal care item (i.e. bar soap, shampoo, toothbrushes, etc.) to bring in to help the residents of Marygrove in Florissant. Marygrove offers a safe and healing environment for children, teens and young adults. St. Rose students also recently collected change in a friendly classroom competition for the American Diabetes Association and had "Cupcakes for a Cause" during lunch each Monday in November in support of the Alzheimer's Association.